It's very hard to be a good daughter. Meet Sarah. She is a seventeen-year-old girl from a conservative urban family. Sarah has to do all the chores of the house, keep her family members happy and her reputation clean so that people don't gossip about her, and always look good so that she can be the ideal candidate for the rishtas that come her way. 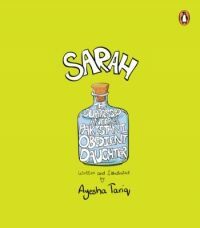 All this really upsets Sarah, but being the Pakistani obedient daughter, Sarah can only suppress her anger. However, this time Sarah's patience has run out and she cannot hold in her indignation any longer. Ayesha Tariq was born in Karachi in 1988. She graduated with a bachelor's degree in Design from the Indus Valley School of Art and Architecture. She works as a designer, illustrator and an improv artist. She currently lives in Karachi and is the Creative Head at the Citizens Archive of Pakistan and the Managerial Director and Improviser with The Platoon.